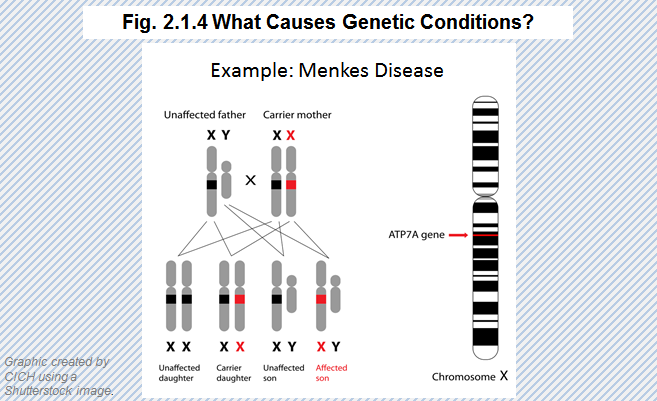 Home Modules Module 2 Section 2 What Causes Genetic Conditions? Gene mutations can be inherited from parents; however, mutations in genes and chromosomes can happen unexpectedly and usually for unexplained reasons. Mutations that exist in the parents’ genes are inherited mutations. New mutations, which occur during the transmission of genetic material to the next generation, are called de novo mutations. It is important to obtain a complete family history to better understand genetic risk factors for children and their families.